Take a look at the Pineapple Express over Northern California. They are getting what we had a week ago. For us, another day and slight changes to our forecast. As reported yesterday, the low is staying further to the north, which will keep the bulk of the rain there. The low pressure system is almost stationary right now just pumping rain from San Francisco north. The low will begin to sag tonight and shift some rain our way. This system, however, is really going to fall apart as it rounds point conception. Looks like all areas Santa Ynez and north will begin to see rain over night into Saturday. Santa Barbara should see the same Saturday morning, but it now looks like the buck stops over SB. No rain is likely Ventura and south. Rain totals still look good for SLO County at up to 1.25 inches and around 1/2 for Santa Ynez. Then they drop off to 1/10 to 1/3 for Santa Barbara. The rain event should be over by noon. As far as wind goes, they are talking about 5 to 15 miles an hour from the north, with 20 mile an hour gusts. This is typical after low pressure rolls through and will be manageable. Sunday will be nice and good weather rolls through next week. Inland valley (Santa Ynez) will see 80s. It looks like a few weak systems roll to the north, but should not affect our area, with rain at least. From the earthquake front, I was driving so I did not feel it, but I had a number of people call me and ask if I felt it. It was 5.3 and center at Santa Cruz Island off the coast of Ventura. I have my new back-up generator all set up now, in case the big one comes and we lose power. 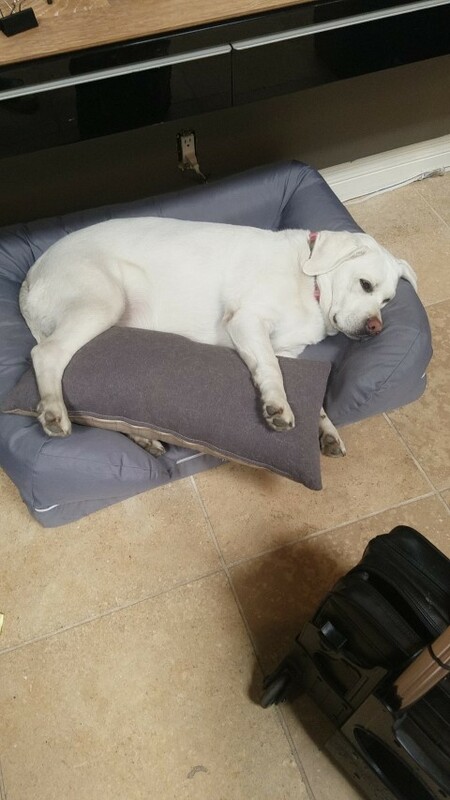 A rough office day for Pearl. I am off to San Diego for 2 days for a weekend getaway. Thank you for the facia repairs and skylight cleaning. We hope all those termites and dry rot stay away from our new boards for a long time!